The concert, which benefits Amnesty International, will mark the human rights organisation's 50th anniversary. For the first time, the event will be held outside of the UK, at New York's Radio City Music Hall. 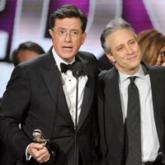 Other acts appearing include US comedians Jon Stewart and Stephen Colbert. Tickets go on sale on Monday. The last Secret Policeman's Ball was held in London in 2008. Organisers say the move to New York will mark the special anniversary. "For us, it's iconic and a very special thing and has provided the opportunity to really celebrate the presence of freedom of expression and free speech, and how we can move people and how we can bring people together, and just how powerful that is,'' Amnesty International spokesman Andy Hackman said. He added that this year's line up was an "incredible representation of the best comedians and musicians in the world". The first Secret Policeman's Ball was held in 1976 with the help of British comedy actor John Cleese. The Fawlty Towers star enlisted his Monty Python colleagues who also participated in the event - which was called A Poke In The Eye (with a Sharp Stick). The name, the Secret Policeman's Ball, was adopted in 1979 and the event moved from comedy to incorporate music. Since then, the likes of Eric Clapton, Rowan Atkinson and Eddie Izzard have all taken part.